Mitchell has recently been teased for his stature being so small. He has just finished his first year of house league hockey and went from a boy never on skates to a boy that blew all the parents, including his own away! Thank you for your dedicated commitment to helping the Raptors Foundation lift spirits and change lives for children in need across Ontario. On behalf of the Raptors Foundation, thank you for your continued contribution to the Give-A-Kid-A-Game ticket donation program. Q. In the past you’ve made comments about the issue of respect in regards to the Leafs and your free agent status. Please shed some light on this. A. I think respect is about how you treat people. You treat people how you want to be treated. That’s what my father taught me when I was growing up. This was the first time I was an unrestricted free agent. Everybody holds that as the trump card in their career, but I just felt I wasn’t really enjoying it as much as I thought I would. It was more of a stressful time for me and after the CUJO situation, I really thought I was going to go too. I was pretty disappointed when he went because I’m close friends with him. Ultimately I had to make the decision that was right for me as a person. BOSTON-During this remarkable, rather stunning, seven-game streak the Maple Leafs are riding, they have won some with offence, they have baffled opponents with smart defence and they have gutted out victories with gritty determination. Chalk up last night’s win to ruthless efficiency. In what was billed as a showdown for first place in the Northeast Division, Toronto simply rolled over the hometown Bruins, shredding former Leafs netminder Felix Potvin for six goals en route to 6-0 pasting. 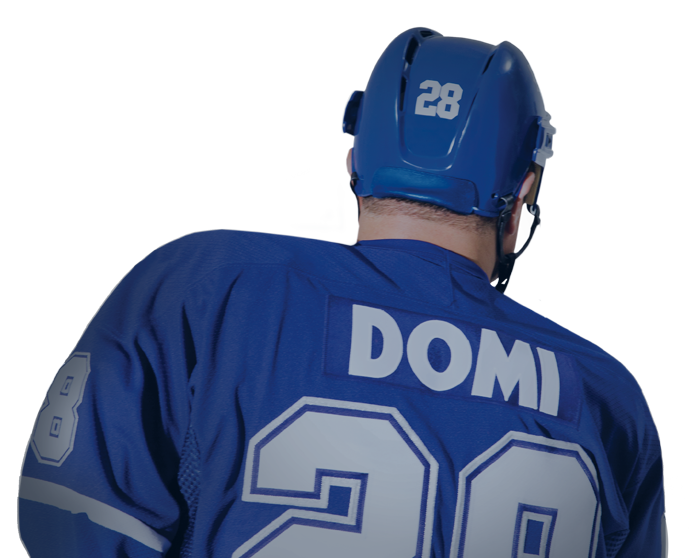 The Toronto Maple Leafs’ Tie Domi is as energetic off the ice as he is on. It was hard to decide which garnered more attention: the striking Magna clubhouse or the glistening new, candy apple red Ferrari Spider that was parked in a select spot in front of it. It shouldn’t have come as a surprise that the owner turned out to be Tie Domi, someone used to making heads spin around on prominent stages.